We all memorize random bits of information about our favorite science fiction stories, just from long exposure to them. But we're aware, on some level, that it's all useless information. Except that some trivia is anything but trivial. Here are 10 pieces of science fiction trivia that could be really helpful in real life. To compile this list, I asked some of my friends for help, and also asked on the io9 Facebook page. Thanks to everyone who helped out! 10) The solution to the Death Zone maze in Doctor Who, "The Five Doctors"
This is how I remember the first eight digits of Pi — because the First Doctor intones them right before he starts tossing coins out onto the deadly chess board that can only be crossed if you step on the corresponding numbers. For the ninth digit and beyond, though, you'll have to use other means. 8) "Fear is the mind-killer"
Everybody is fond of quoting this passage from Frank Herbert's Dune — but it's actually a useful bit of psychology that can help you to overcome fear. In Larry Niven's story "The Kiteman," we learn that the most important maxim in the Smoke Ring is: "East takes you Out, Out takes you West, West takes you In, In takes you East. North and South bring you back." But what does this mean? It makes more sense once you realize that "East" means co-orbital and "West" means anti-orbital, and "in" and "out" are in relation to the central neutron star. On Star Trek: The Next Generation, they're always going on about the Heisenberg compensators, a component of the transporter that gives them a lot of trouble. But this can actually help teach you about Heisenberg's Uncertainty Principle, the notion that you can't know a particle's location and momentum — which those compensators presumably compensate for, somehow. Fahrenheit 451 refers to the temperature at which paper bursts into flame — and now you know what that temperature is, in case you ever need to burn some papers in your oven. Quote Forbidden Planet often enough, and you'll learn something about our psychology that's as valuable as "fear is the mind-killer." The monsters are described as coming from the id, the primitive part of the brain, which introduces you to the idea that we all have primitive, aggressive impulses in our psyche that come from a primal place and can't be gotten rid of. 3) "Big Brother is watching"
Actually, George Orwell's 1984 is full of quotable phrases which people spout off at the least provocation — and they give us a way to talk about the rise of the surveillance state, and the fact that Big Brother really is watching us now. Not to mention how useful "newspeak" is in our era of media double-talk. 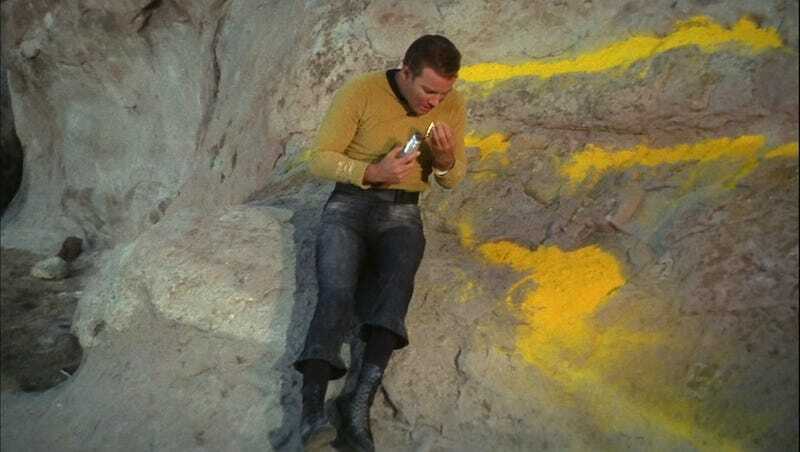 Anyone who has obsessed over the Star Trek episode "Arena" and can quote it from memory also knows the ingredients of gunpowder. In particular, you might not have realized potassium nitrate was an ingredient in the stuff unless you saw Kirk dealing with it. Han Solo brags that the Millennium Falcon did the Kessel Run in under 12 parsecs — prompting decades of fans to point out that parsecs are a measure of distance, not time. Which means now you know what a "parsec" is. (It's equal to about 30 trillion kilometers, or 3.25 light years.) And yes, there is an explanation for this in one of the novels — he was talking about shortening the distance of the trip by steering dangerously close to black holes, or something. Thanks to Adam Rogers, Horace Austin, Matthew du Plessis, Zem, Jennifer Kretchmer, Liz Taylor's Earrings, Ilana Teitelbaum, Jake Kerr, Sunil Patel, Scott Stearley, Cameron Marston, Chuck Hinshaw, Diane Barnett, Bill Rogers, Eric Hoepelman, Doug Champion, Sreedhar Yedavalli, Johnny Peters, Derek Collins, Adam MacGregor, Leighton Shell, Debie Baugher, Sarah D. Baker, Anthony Collado, Diana Heald, Chad Wayne, Aengus Fallon, Joe Meils, David Voderberg, Edmond King, Jeff Ballentine, Adam Novak, Kenneth James, Joshua L. Rubin, Thom Pintello, Jennifer Anne, Merrill Barrel, Jeff Bosco, Nick Sievert, Ed Parton, Kurt Miller, Chris Smith, Bruce DeShettler II, John Hulslander, Patricio Carrasco, Michael Arsenault, Matthew H. Smith, Hugh Kenneth David, Patrick Geberth, Heidi van der Vloet, Matt Brown, Kevin Leroux, Shane Moorhouse, Anita Lerae, Gary Stott, Al Bartlett, Jerry Taylor, Tobias Lake, Billy Baughman, Adam Kennedy, Carl Minns, Emmanuel Mayer, Lucas Pitcher, Richard Waters, Evan Blanton, Ashutosh Mohanty, Thomas Meyers, Zack Heffner, Dan Brown, Justin Adams, Eddy Velazquez, Matthew Lohse, Scott Finstad, Isabella Smith and everyone else who responded!